Once you have already imported some products into the Products Catalog, updating those existing products is very easy! To do so, simply set up a CSV file with the new product information that you would like to update, and follow the steps below. 3) In the pop-up that appears, click "PICK A CSV FROM YOUR COMPUTER" to select the file for upload. Update only empty attributes of existing products - If checked, empty attributes of existing products will be updated from the CSV file, and existing attribute values will not be affected. Replace existing product images - If checked, existing product images will be removed and replaced with images from the CSV file. If unchecked, images from the CSV file will be added in addition to the existing product images. Ignore blank CSV cells during import - If checked, any blank cells in your CSV file will be ignored, and the existing attribute values will not be affected. Once ready, click "NEXT" at the bottom right corner of the window. 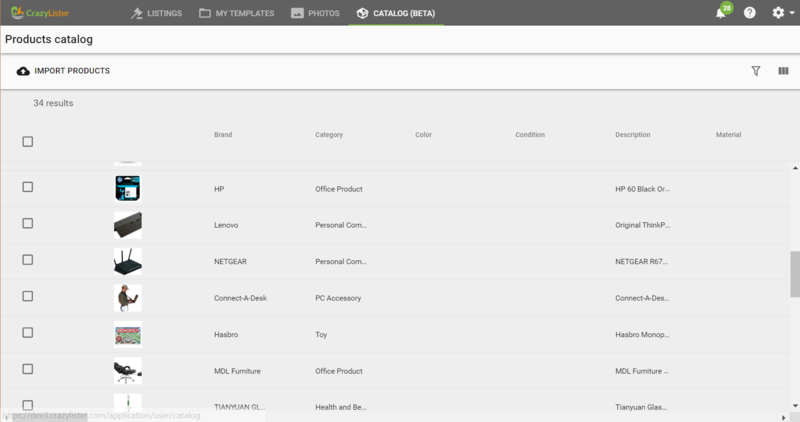 5) You will now need to match the information from your file with product attributes. You will see the column titles from your file appear on the left-side, while the product attributes appear on the right-side in drop-down menus. 7) Your products will begin updating with the information in the CSV file. Please note that the process may take some time depending on the amount of product information you had in the file.